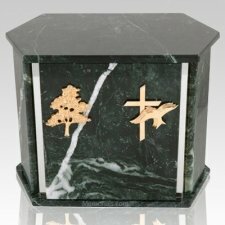 The Hexagon Silver Blue Tone Granite Companion Urn is assembled from real natural quarried stone and features a stainless steel trim. The urn has the option of a matching stainless steel emblem or a contrasting 24k gold plated emblem. The bottom has felt to protect the surface were the urn stands. A wonderful natural stone urn which will unite your love forever and ever. The Urn is a companion urn which means an urn for two people. "I had purchased the necklace for my mother and place my father’s ashes in it. It was beautiful. My mother was so happy that she could keep the love of her life so close to her heart. She has told several of her friends and relatives and the comment has been made that they would like to make a similar purchase. Thank you for having a product that can comfort a person who has lost the loved one… "